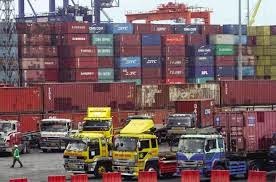 POLITICAL TIDBITS: Unrelieved congestion at Port of Manila (82,000 containers) shoots up prices of commodities as X'mas approaches. 200-year old Pedrosa mansion in Palo and 50 other old houses ordered bulldozed for "street widening"---little regard for Heritage. Unrelieved congestion at Port of Manila (82,000 containers) shoots up prices of commodities as X'mas approaches. 200-year old Pedrosa mansion in Palo and 50 other old houses ordered bulldozed for "street widening"---little regard for Heritage. I heard a TV personality last night airing complaints of Filipinos abroad, as to why their relatives in Manila have not yet received their balikbayan goodies they had sent early enough. A columnist in a Manila paper queried why, despite the prices of imported oil going down, the price of foodstuffs hasn’t come down. The answer to both these queries is simple: the congestion at the Port of Manila where all these shipped goods are forwarded, has not been alleviated. In my blog early last month, I wrote of the paralysis in the Port of Manila that's affecting the entire economy. The problem is that this has not been relieved but in fact it even worsened and magnified the urgency of a solution, as the Christmas Season is upon us. There are presently some 82,000 containers (!) and no one seems to have a solution to getting these containers moving, other than President Aquino begging's for patience, patience, as his people try to seek solutions that haven’t come, But it’s four weeks to Christmas Day, when most of the goods in those container vans have to be under Christmas trees in homes or in windows of department stores. But they’re not. So prices of goods available will shoot up. Some days ago, I saw an urgent suggestion in the newspaper from the private sector asking Malacanang to appoint a PIER CZAR to handle the frightening congestion, but Palace reaction was to simply turn it down. It's just like the traffic in Metro Manila about which everyone complains, but no explanation is being given on what's being done to alleviate congestion---both at the pier and on Metro Manila’s streets. In what’s supposed to be a season of grace and cheer, tempers are rising and the businessmen are pretty turned off by loss of their markets and the increased costs of unwanted, and oftentimes unpredicted storage. Unfortunately, more attention even at this point is being made to politics---destroying the administration’s perceived enemies or trying to beef up support for whoever would be the LPs' candidate---when there are more immediate problems such as the congestion at the Port of Manila and the horrendous traffic. Mr. Aquino should know that soon he’ll begin to look like Mr. Scrooge, the spoiler of Christmas. The Pedrosas, which count a number of prominent citizens---aside from lawyer Ramon Pedrosa, there's banker Carlos Pedrosa; the deceased Ambassador Alberto Pedrosa, former husband of Star columnist Carmen Navarro Pedrosa; Msgr. Augusto Pedrosa of the Manila Archdiocese, and civic leaders Josefina P. Manahan and Lita P. Hidalgo---are all descended from Luisa Acebedo and Don Pio Pedrosa, who had made a name as a prominent Cabinet member in several administrations. Palo in Leyte figures prominently in the next two months as plans call for Pope Francis to plane into Tacloban Airport where he'll say mass right at the tarmac; from there he’ll be driven right away to the Archdiocese of Palo a few kms.away to meet with Yolanda-stricken families of Tacloban over lunch in the residence of Palo Archbishop John Du. Unfortunately there seems no plan to let the Pope see the famous tent cities of the homeless in Tacloban. There are about 300 old houses in the town center of Palo, along San Salvador St. and Don Pio Pedrosa Avenue, with some of them right in front of the Cathedral of Palo and the Archbishop’s residence. The oldest there is the 200-year old house that had belonged to the family of Luisa Noble Acebedo, who had married Pio Pedrosa. Over past decades, as the large Pedrosa brood moved to Manila, the ground floor of the Pedrosa home was converted into a public library, paying no rent to the family. The Pedrosa mansion played a distinct role in Palo’s history, for at one time or another it had played the role of municipio, jail, post office and municipal school. 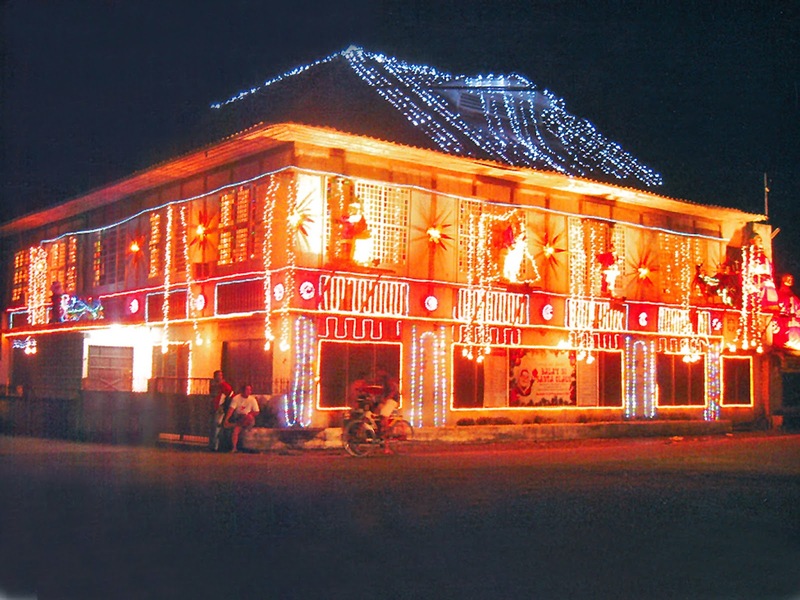 During the Revolution against Spain the mansion had served as headquarters of the Katipunan in Leyte. Upon landing at Red Beach, Palo, in October 1944, Gen. Douglas MacArthur, former President Sergio Osmena, his aide-de-camp Gen. Carlos P. Romulo and the liberating forces stayed in the Pedrosa mansion. For decades afterwards, the house has served as public library of Palo, free of charge. Then misfortune upon misfortune fell on the old homes: over a year ago Yolanda destroyed most of the prominent ones in that town center; the Pedrosa mansion, which boasted of typical Spanish architecture of 200 ago, was reduced to a mere shell (the old Palo Cathedral across was unroofed).. That’s how strong Yolanda was, but now, as the homeowners regard it, the "aftermath" could be far more damaging. 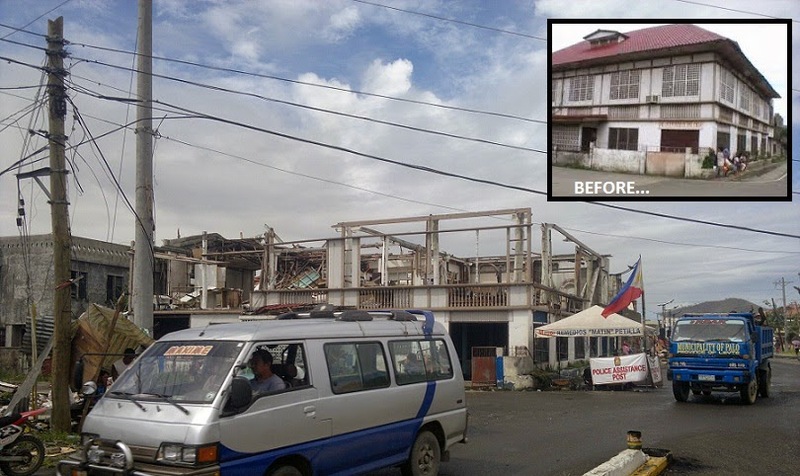 Over the past years several notices from the DPWH have already been received by the owners of those iconic houses. The latest order came last month, which obviously sought to capitalize on the severity of the typhoon's damage---ordering them to demolish whatever was left by Yolanda in order to give way to "street-widening" that will ease up traffic congestion in that major thoroughfare. If the homeowners refuse to cooperate, said the DPWH memos, it would bulldoze those houses and charge them for the labor and materials used, and make them answerable for their "obstinacy." The tenor of the orders seems worse than a throwback to the Marcos era. The homeowners lament that instead of helping them rebuild their homes, government chooses to make their lives more miserable by throwing them out into the streets. The Pedrosas have the support of fellow home-owners in Palo and they are determined to fight the demolition and street-widening. What makes the case interesting is that there are already two by-pass roads, one in the East and another in the West, with complete funds available, and in fact one bypass road is already finished. The concerned homeowners stress that with these bypasses there would be no need for the street widening as congestion would ease up in the town center; it would also decrease pressure on the old Bernard Bridge between Palo and Leyte, which is already showing "over-use fatigue." What amazes the homeowners is that despite the definite ease-up of traffic with the completion of these road bypasses, the DPWH still insists on the widening of San Salvador St., which means demolishing all those old homes, including the iconic Pedrosa mansion. This lead family in the crusade has written Dr. Maris Diokno of the National Historical Commission of the Philippines for help and she has communicated to DPWH her desire for a conference, reminding it of RA 1066, on the preservation of heritage structures. The Pedrosas, backed up by 583 petitioners, have also written to Leyte officials including former Gov. and now Mayor of Palo Matin Petilla and, more importantly, to President Aquino---but to date no response has been received from anyone of them. So what gives? For the fund of it? My quarrel with custodians of our heritage is that they always come in too late---take a look at the protests over the DMCI building behind Rizal Monument, now that it's almost finished. I also recall the destruction of the magnificent bahay na bato of the Yaptinchays in Binan, Laguna, which was the setting of the beautiful movie based on Nick Joaquin’s play, "Portrait of the Artist as Filipino," starring two great actresses, Daisy Hontiveros-Avellana and Naty Crame Rogers, as the spinster sisters guarding their home. I was able to visit that Binan mansion some time after I saw both movie and play by Nick Joaquin and how I admired it---so huge that it covered a whole block. I never saw anything like it in all the country. But unfortunately the next thing I knew, it was demolished and gave way to a shopping complex . Perhaps the heirs didn't think it much fun to be hearing someone dragging a heavy ball with chains in the middle of the night (as stories abounded about the mansion), but a government agency tasked to preserve such historic places could have taken over. It is truly mournful that we Filipinos have so little sense of history. Manila used to be a charming city with such lovely landmarks, but they are all going or gone. 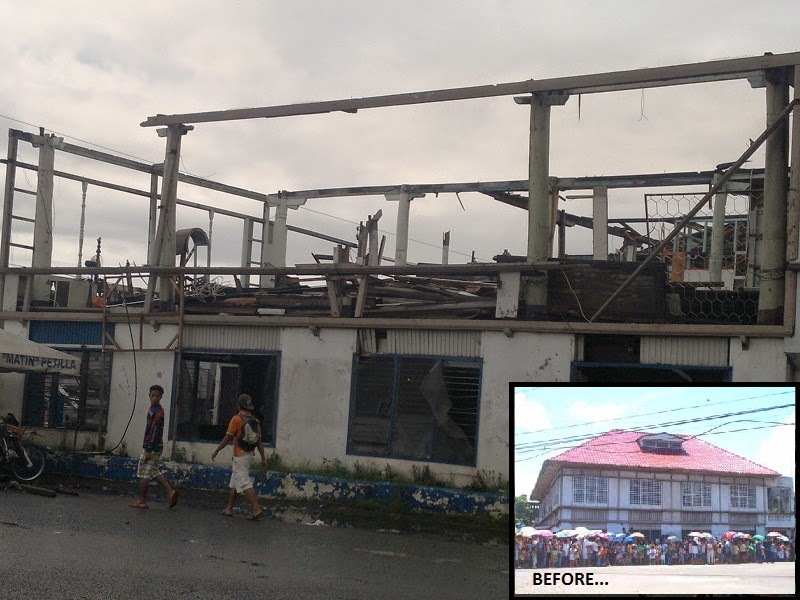 Let’s help in the crusade to preserve the old houses of Palo, Leyte. Please write letters to Sec. Singson, Commissioner Diokno, even P-Noy.